One of the interesting things to do with Our Blue Marble (free, AppleTV App Store) is to observe some of the more extreme weather the planet has experienced over the past six months. This article from weather.com describes the notable events from this year’s hurricane season. You can combine reading about these events with looking at the imagery of the Earth during the same time period. Not all events can be seen, as the satellite was not reliably sending back a full set images every day, but many of them are easily observable. You can then move between days to watch the events build and dissipate. Some of the more interesting ones - a triple hurricane event in the Central/Eastern Pacific - a first! I quick web search for the location and date revealed it was Tropical Cyclone Chapala, one of the strongest storms ever recorded in the region. Have fun looking for your own extraordinary weather events! If you find one you’d like to share, I’d love to hear about it - email support@littlepotatosoftware.com or on Twitter at @littlepotatosw. Pairing it was fairly painless, and just required me to turn on Home Sharing on the AppleTV. I hadn’t bothered with that in the past, but once it was on for both the AppleTV and the Remote app, the AppleTV showed up in the Remote app and everything Just Worked. The Remote app does NOT act as a game controller. Dolphin Patrol, which relies entirely on the game controller API, doesn’t work at all. Even the Menu button doesn’t work, which is a little annoying, since you can use Remote to get into the app, but need to pick up the Siri remote to get out of it. The Remote app sort of works for other apps. The Menu, Select (i.e. tap on the touchpad), and Play/Pause buttons work. However, swiping on the touchpad doesn’t appear to work, even though if you are navigating basic UI controls, such as a UITableView, the swipes work. But gestures I created using UISwipeGestureRecognizer are not being recognized. I verified this with two other apps that weren’t mine - Beach Buggy Racing doesn’t work at all, so I assume it is using the Game Controller API. Plane Finder works in much the same way Our Blue Marble works - button presses are ok, but you can’t swipe around. Sadly, this also means that when you run the “Sharks” app, you only get to see one of the cameras - swiping to select the other camera doesn’t work. There is an “Options” button near the Menu and Play/Pause buttons. I can’t figure out what it does. Overall, a great improvement, particularly for entering in passwords and such. For something that I would have expected to be there on Day One, it is rather amusing that I’m pleasantly surprised that it has come out “already”, but in any event, glad to have it! Our Blue Marble - New AppleTV App released today! I am very excited to announce the availability on the AppleTV app store of my newest app, Our Blue Marble. Our Blue Marble makes the images taken by the NOAA’s Earth Polychromatic Imaging Camera available on your television. These images are amazing - anywhere from five to twelve images are available for most days and they are taken throughout the day so you see the rotation of the earth. The satellite and camera started sending photos back in June. 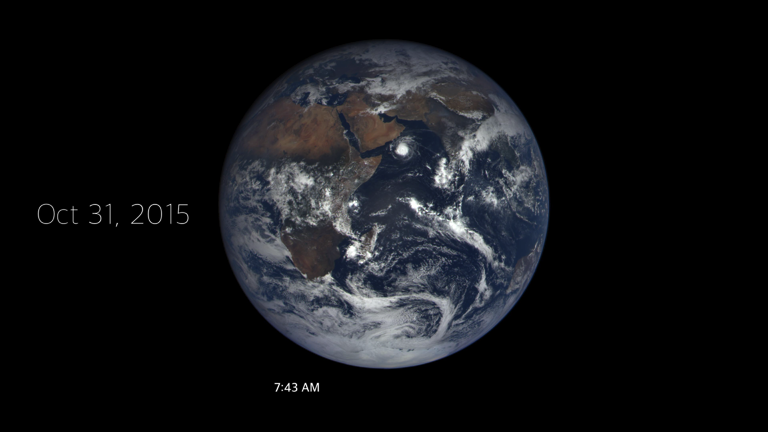 If you compare the photos from June until now, you can really see how much the Earth has tilted on its axis. Winter is coming, indeed! Right now, it’s a bit hard to see North America, but you get an amazing view of the constant swirling clouds around Antarctica. Our Blue Marble is available for free on the AppleTV app store and can be downloaded today. Just search for “Our Blue Marble” to find it! A little backstory on why I wrote this app: In late October, I read this article at usnews.com. I wouldn’t say I’m a huge space geek, but something about the images, and the long, politically influenced road they traveled, really resonated with me. I started browsing the NASA site and thought how cool it would be to see these images on a bigger screen, such as my television. I had already released on AppleTV app (Dolphin Patrol), so I took a development “break” to see if I could put something together to display these images. It was my first time doing any kind of HTTP/network programming, but it went together pretty easily and in a few days, I had something to submit to the App Store. Then, cooler heads prevailed, and I decided it probably wasn’t the best idea to submit an app that pretty much assumed that every network request completed successfully every time, and I took couple of weeks to beef it up and clean up the interface. My goal was to present the images with as few distractions as possible. I really think they speak for themselves. There are ways to browse the archives too, since seeing how the planet changes over time is fascinating. 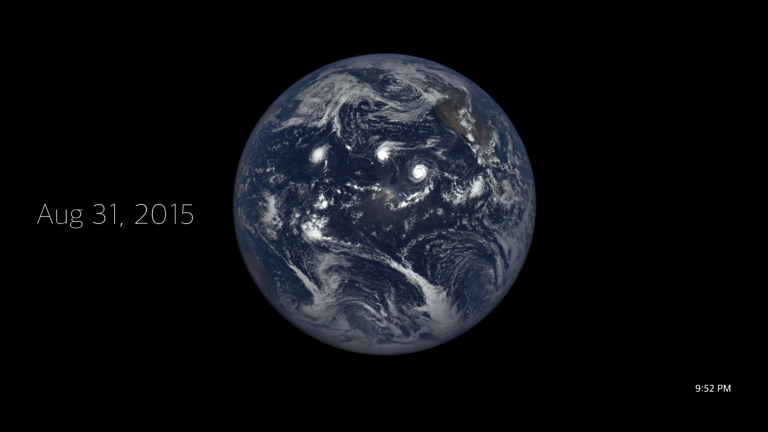 The most amazing part was seeing how much the Earth has titled since the summer. I can’t wait for the winter solstice so I can start watching our continent start tilting toward the sun again! I’ll make another blog post pointing out some of the cooler images I’ve noticed while testing the app. I hope you enjoy seeing this unique view of our planet! Just listened to Episode 74 of “The Broad Experience”, where they discuss confidence. This was the first time I had listened to this podcast, and I really enjoyed it and look forward to listening to some back episodes. So much of what they said really resonated with me. Being more confident about our skills and putting ourselves out there is hard, but definitely necessary. Working on my own from home, it’s easy to get stuck in a mindset of not promoting yourself and feeling confident about what you are working on. Even something as simple as reaching out to add my blog to the list of tech blogs by women that Brent Simmons recently started gives me pause. (I’m a developer, I’m a woman, this should be a no brainer!) I debated and hesitated, and finally sent him a tweet over a week later. Even now, I’m noticing that I’m not in the OPML file (or Twitter list), and will need to work up the nerve to ask to be added to it. Increasing confidence - one step at a time!